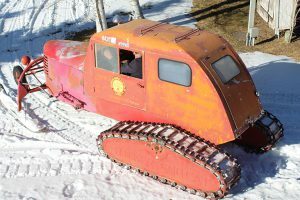 It looks like something plucked from Dr. Seuss’ doodle pad: Mountain Parks Electric’s 1956 Model 423 Tucker Sno-Cat appears to be a cross between a classic pickup and a snow transport, complete with steel sprockets, moving track wheels, dual front runner skis and a vintage grille and hood. Tucker Sno-Cats have been used in the harshest winter conditions, including the Arctic and Antarctic regions. Its once cherry red paint peels from a half century of exposure to ultraviolet rays at 8,000 feet in Walden, Colorado. Patches of its original orange coat and flecks of rust now bleed through. Some call it patina — an oxidized beauty for those who can see it. But even for people who aren’t “gearheads,” something about the vehicle’s contours awakens a curiosity, beckoning passersby to step inside the cab, crank over the Chrysler flathead six cylinder engine and answer that burning question: Does this thing actually work? More questions followed: What was the Sno-Cat’s history? How did MPE get it? How was it used? Finding the answers compelled Sifers to ensure that the machine was restored. On September 7, 1961, the Continental Oil Company sold its 1956 Model 423 Tucker Sno-Cat to MPE for $1,010, less than the sticker price of a new pickup truck. The Model 423 — a 400 series model with two tracks and three doors — was manufactured by the Tucker Corporation in Medford, Oregon. It offered dependable over-snow transportation and a heated cab. “No snow too deep … no road too steep,” Tucker’s slogan went. It was a claim that Continental Oil Company substantiated. Despite an average annual snowfall of more than 60 inches, the Walden snows were not too deep for the Sno-Cat to operate in the McCallum Oil Field. It only stood to reason that the snowfall would not be too deep for restoring power to Jackson County’s more remote areas either. There, heavy snows often buried roads, taxed overhead power lines and sometimes left rural Jackson County residents without electricity for days at a time. The Sno-Cat became the centerpiece of MPE’s power restoration winter fleet through the 1980s. But with a fuel efficiency rating of approximately 7 miles per gallon and a top speed of only 15 miles per hour, it eventually fell out of favor, thanks to the technological advancements of modern snowmobiles. Even so, during its heyday, it surpassed all expectations for reliability and usefulness. In the 1970s, MPE’s Walden linemen Carly Norris, Carol Hale and Stan Swaney trucked MPE’s Sno-Cat south of Walden to the Ute Pass area in response to a small two-passenger plane crash. It was not the only time Sno-Cats were called on in the locality’s search-and-rescue efforts. They were used extensively in the December 4, 1978, Rocky Mountain Airways Flight 217 crash one in Colorado’s Buffalo Pass, a remote area not far from Steamboat Springs. That day, under blizzard conditions, a small commuter plane full of skiers crashed en route to Denver. Remarkably, thanks in part to MPE’s Sno-Cat rescue operations, 20 survived. MPE lineman Norris was part of the rescue effort that day. He and Jackson County Sheriff Irvin Swayze, using a small receiver, identified the plane’s emergency beacon. Last year, MPE’s Sno-Cat once again found itself in the limelight. A photo of the snow machine won the “Vintage Utility Vehicles” category in a photo contest sponsored by the National Rural Electric Cooperative Association’s RE Magazine. The winning picture was posted on MPE’s Facebook page and elicited a response from Patty Tucker (a descendant of the Tucker Sno-Cat founder). “My husband’s grandfather and sons built this,” she wrote. Robert Taylor is Mountain Parks Electric’s manager of communications and is a novelist and former columnist for the Sky-Hi Daily News in Granby, Colorado.